Practices can apply to be accredited at different levels depending on the services they offer. Core Standards, General Practice, Emergency Services Clinic and Veterinary Hospital remain as the main accreditations, with criteria based on services provided by the practice, as well as other factors such as facilities and equipment. The new Scheme also introduces a new accreditation: Equine General Practice (Ambulatory) for those equine practices without premises where animals are treated. Practices will be assessed across a range of different criteria encompassing areas such as client experience, clinical governance and the practice team. These standards are relevant to all veterinary practices and reflect mainly legal requirements which must be met in running a veterinary practice, together with guidance as set out in the Code of Professional Conduct. Every practice premises within the Scheme must meet Core Standards for all species treated by the practice premises. For Small Animal and Equine practices the standards reflect the requirements of a primary care practice which also aims to facilitate the achievement of high standards of clinical care, and encompasses many of the facilities required for veterinary nurse Training Practices. 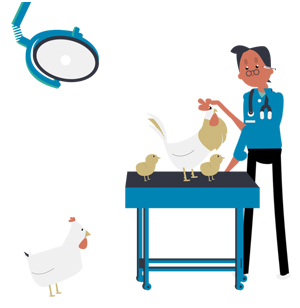 For Farm Animal practices, the standards reflect both the requirements of a primary care practice which promotes the achievement of high standards of clinical care, and also a proactive approach to management, through the use of health planning, client training and communication. A General Practice must meet all the Core Standards as well as additional General Practice Standards. Equine General Practice – Ambulatory is a new accreditation level. It recognises there are equine practices that provide a GP level service (see above), but do not have stabling facilities or premises where horses are treated. General Practice – Ambulatory practices must meet the Core and GP requirements in all modules except In-patients. For Small Animal Emergency Service Clinics, the standards reflect the work of a practice that can deal with emergency and critical care cases without an appointment. A Small Animal Emergency Service Clinic must meet the Core and General Practice requirements in all modules and the ESC requirements in the Emergency and Critical Care Module. For Small Animal and Equine Veterinary Hospitals, the standards reflect the requirements of a General Practice allied with additional facilities and protocols for the investigation and treatment of more complex cases. A Veterinary Hospital must meet all Core Standards and General Practice Standards in addition to specific Hospital Standards.